Lucky the Vulture: Ask me if I can whup that tiger. Go on. Go on, ask me. Buzzy the Vulture: Can you whup that tiger? Lucky the Vulture: I "Shere Khan". Shere Khan: Isn't it ironic that your name is "Lucky"? Mowgli: I never knew where I came from. But I always knew where I belonged. Lucky: Not everyone can be born with such great looks. Mowgli: That village was terrible. All you ever hear is rules, rules, rules and work, work, work. Baloo: Whoa, kid. Watch your language. Kaa: [hypnotizing Shanti] Exssscussse me, pleassse... might I be of sssome asssissstansssce? Shanti: [Shanti is lost in the jungle] Who's there? Kaa: ... might I be of sssome asssissstansssce? Kaa: Are you lossst, little one? Are you hungry? I'm ssstarved! Mowgli: Oh, Baloo! I don't ever wanna see that girl or that village again. Baloo: Well, of course you don't. It's just us bears from here on in. Kaa: Are you hungry? I'm starved. Baloo: Kid, show me you can still fight like a bear. Baloo: In case you haven't noticed, kid, I'm no wild animal. Except at parties. Shere Khan: You seem surprised to see me, man cub. Mowgli: Hit it, Papa Bear! Baloo: You don't need her, kid. You're with old Baloo now. Shere Khan: No matter how fast you run, no matter where you hide, I will catch you. Lucky the Vulture: What's the matter, Stripes? Man cub got your tongue? 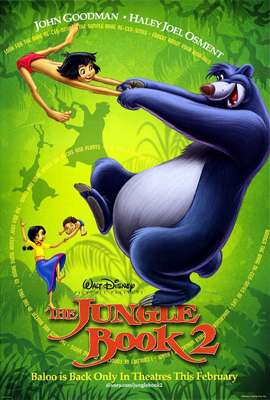 Baloo: You want quiet, go back to that man village. This place is happening.